UPDATED: There was no firing of the canons at the Akershus Fortress because Ukraine’s president, Petro Porosjenko, was making an “official” visit to Norway on Tuesday and not the more formal “state” visit. Commentators noted that the visit was nonetheless packed with symbolism, as Norway demonstrates support for a land under enormous pressure from an unpredictable fellow neighbour, Russia. Prime Minister Erna Solberg was the official host for Porosjenko, starting with a midday meeting at her official residence and ending with a banquet at Akershus. Porosjenko was also invited for lunch at the Royal Palace with King Harald and Queen Sonja, and meetings at the Parliament with its president, Olemic Thommessen, and the parliament’s standing committee on foreign affairs and defense. Porosjenko’s day in Oslo was also to include a Norwegian-Ukrainian business forum and a roundtable discussion at the Opera House with Oil Minister Tord Lien on energy. It would concentrate on how the energy markets are organized, and be attended by Norway’s major players Statnett, Statkraft and NVE. Through it all, editorialized newspaper Aftenposten on Tuesday, was a pattern of heavy symbolism, as a president under heavy pressure met with top officials of a country that can help provide energy and financial support. The visit itself was branded as historic, with the Office of the Prime Minister noting that it was the first time a Ukrainian head of state visited Norway. The stated goal was to “strengthen and develop the bilateral relationship between Ukraine and Norway.” The emphasis was on political conversations, business cooperation and Norwegian support for Ukraine’s reforms. 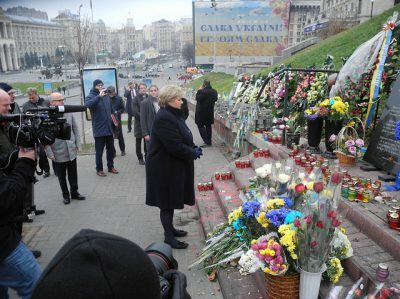 Solberg herself visited Ukraine in November 2014, so wanted to reciprocate with Norwegian hospitality. It was Russia’s decision to annex Crimea and support Ukrainian insurgents that brought tensions between Russian and western nations to the boiling point two years ago. Since then, nearly 10,000 people have lost their lives in armed conflicts still going on in eastern Ukraine. A Russian rocket has been blamed for shooting down a commerical airliner over Ukraine and Porosjenko is presiding over a country that’s split and known for corruption. Porosjenko is clearly worried, too, but commentators in Oslo said he appeared resigned, even laconic, in his assessment of the ongoing crisis as he headed into another round of talks in Berlin on Wednesday with German Chancellor Angela Merkel, French President Francois Hollande and Russian President Vladimir Putin. Porosjenko said he was “optimistic” about Ukraine’s future but not optimistic about the meetings in Berlin. He warned against having any high hopes. Norway, meanwhile, can continue to help finance reforms to secure the rule of law in Ukraine and fight corruption, while also providing energy as winter looms. The reform process is moving slowly, though, in Norway’s view, and while Ukraine’s troubled economy has shown signs of improvement, Norwegian officials are expected to put more pressure on Porosjenko to improve state operations and reduce corruption. 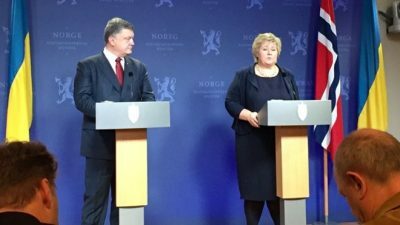 “I confirmed to Porosjenko that Norway will continue its support,” Solberg said. “We want to contribute to long-term stability and development in Ukraine by supporting the Ukrainian government’s implementation of reform plans.